« SpaceOreMiner – Version 1.0 Winners! 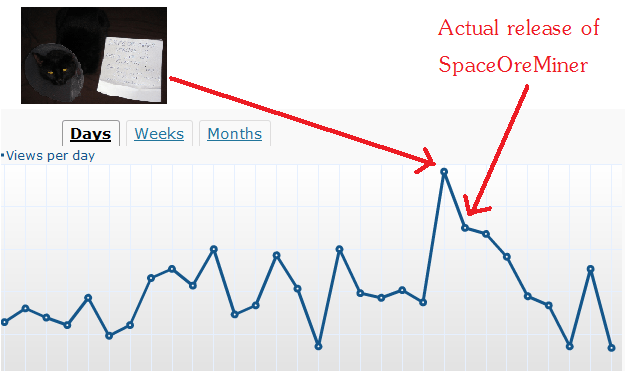 I just thought I would post a screenshot of my WordPress stats screen, proving that catvertising works! The blog got a lot more traffic on the catvert day than it did actually on release day 🙂 I’m assuming that just because everyone was busy playing the game … hehe. This entry was posted on Sunday, November 14th, 2010 at 3:02 pm and is filed under General, Random Thoughts. You can follow any responses to this entry through the RSS 2.0 feed. You can leave a response, or trackback from your own site.